Gardening tools are expensive, especially if you purchase high quality equipment. Taking care of them and maintaining them will allow you to extend their lifetime and make the most out of your investment. It is strongly advised to clean tools after each use. Winter is usually considered the perfect time to clean, oil and polish them, but it is never too late to take care of your garden tools! Gardening tools can get dirty very quickly. Even though a bit of dirt won’t prevent you from using them, it is better to remove mud from your tools for several reasons: it can weaken wood, rust can settle in and your tools will finally lose all their effectiveness over the years. 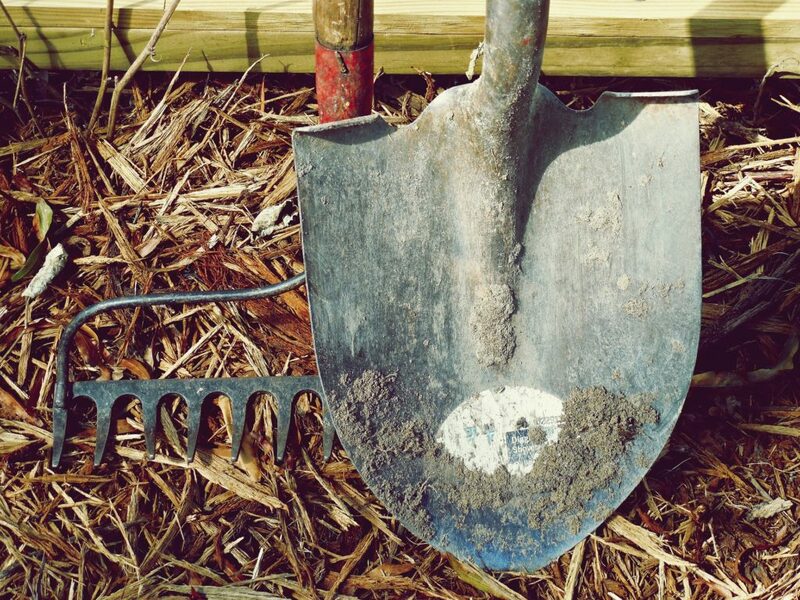 Tools in contact with the earth such as rakes, shovels or spades must be free from all earth residue. Remove dried earth with a brush, hose off with water and dry with a cotton rag. Clean the blades of your pruning and cutting tools with a cloth dampened with alcohol or mint essential oil, particularly effective for dissolving sticky residues. Disinfect them with alcohol at 90° to eliminate bacteria that could transmit diseases to plants. Remember that pots, trays and tutors also need to be disinfected to provide a healthy environment for new plants. They can be vectors of disease just as much as tools, especially if they have contained a sick plant. To disinfect these items, soak them in a bucket with 9 parts cool water and 1 part chlorine bleach for at least 10 minutes. This applies to terra cotta, plastic and even wooden pots. Brush them after immersion. Rinse and dry. A gentle wipe down with a damp cloth is all that is required to clean garden power tools. Even a second-hand garden tractor can last for years if taken care of properly. To help it stand the test of time, invest an electric leaf blower: lift the hood up and blow on the entire machine to remove grass, leaves and dust without any risk of damaging it. Once your tools are clean, always wipe them thoroughly with a clean cotton rag. Sharpen your cutting tools with a mill file, coarse abrasive stone or handheld grinder. Don’t forget to sharpen your shovels and spades too. Once sharpened, their edges will cut through earth and roots easier, allowing you to save time and energy. Steel tools are susceptible to rust. Use a sheet of 80-grit sandpaper or a stiff wire brush to remove larger coatings of rust. An inexpensive option to prevent rust from appearing is to rub motor oil on steel surfaces. It can also be thinned out for easier use with a ratio of 2 parts motor oil and 1 part kerosene or lamp oil. Carefully check each tool and replace cracked handles as they may break at the next use. Sand tool handles with sandpaper in order to keep them smooth and easy to handle throughout the gardening season. Coat wooden handles with linseed oil. Allow the soil to soak in and wipe off the excess with a cloth. Inspect and tighten screws, change them if necessary. It is essential to store your clean tools properly. If kept outside against a fence, they will not last you more than a few seasons. Store them after each use in a cool, dry place where they will not be exposed to the sun and rain, two elements that can cause tools to rust, rot and crack. Backyard sheds and garages are ideal for storing garden tools. Garden power tools should be stored unplugged in a secure location. Smaller power tools can be placed back into the hard plastic cases they usually come with. Larger items, such as lawn mowers, must be covered and completely drained from fuel before long storage periods. Organize your tools according to how often you use them. Make sure they are not left on the floor so they don’t become a tripping hazard. Hang your tools against a wall by their handle with clips and brackets, preferably with blades or dangerous parts facing the wall. You can also keep your tools off the ground with a cheap homemade solution using wooden strips. Smaller items can be kept in drawers or on shelves. Even though cleaning, renovating and storing garden tools may be time consuming, you can be sure not to regret the investment: you are guaranteed to find efficient garden tools whenever you need them.